Creekside 18 at Dubai Creek Harbour. 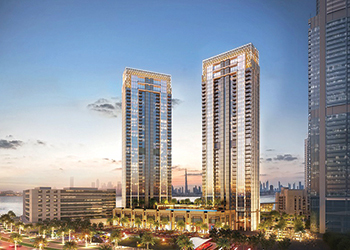 Emaar Properties has launched the elegant ‘Creekside 18’ residences in The Island District of Dubai Creek Harbour, a unique master-planned community located along the historic Dubai Creek. Creekside 18 homes open to inspiring views of the creek, the cradle of Dubai’s cultural heritage and growth; the Downtown Dubai skyline highlighted by Burj Khalifa, the world’s tallest building; and the mangroves of the Ras Al Khor Wildlife Sanctuary, a natural bird sanctuary. Creekside 18 promises a sophisticated new lifestyle choice. It has around 480 residential units comprising one-, two- and three-bedroom glass-fronted apartments located in two 37-storey towers. An additional level of podium apartments are also offered that redefine upscale island living. The development brings exceptional value for its residents led by its location in The Island District of Dubai Creek Harbour. They step out to a vibrant lifestyle defined by the Creek Boardwalk that assures an array of retail, food and beverage (F&B), leisure and entertainment choices. They also have direct access to a stylish marina, yacht club, ferry terminal creek pier, lighthouse, harbour point and more than 1 million sq ft of world-class hospitality and 1.5 million sq ft of luxury retail and cultural amenities. A retail podium, with lush green landscaping, provides a dramatic backdrop for the retail outlets around Creekside 18. Featuring leading international fashion brands and independent boutiques, it will appeal to high-end fashion lovers. To maximise the views, Creekside 18 homes have floor-to-ceiling windows that also assure natural light. All residences have high-quality fixtures, as well as state-of-the-art telecom and entertainment connectivity and round-the-clock security and maintenance. Dubai Creek Harbour, a unique development in Dubai that is defined by its central location, a world-class design and a wide range of lifestyle amenities, is located on a land area of 6 million sq m, and developed by Emaar Properties as a joint venture with Dubai Holding. It also has a wide range of cultural amenities, educational facilities, healthcare centres and leisure choices, in addition to a dedicated retail precinct offering high-end brands.